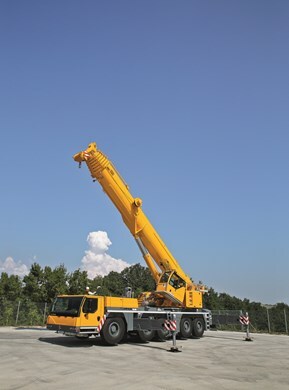 The 50-ton Liebherr Crane is designed with safety and roadway economy in mind. This crane has a double-folding jib and maximum load capacity of 50 tons. Most of its ballast can be carried on the crane, ensuring easier transport on public roadways. This durable crane is crafted from high-tensile fine-grained structural steel and is outfitted with a 6-cylinder diesel engine. Other notable features of this crane include its 38-m telescopic boom, pneumatic disk brakes, three axles, and multiple safety features.